Introduction Unilateral labyrinthectomy and intra-tympanic gentamycin have been employed in the treatment of Ménière's disease, but the efficacy of these techniques has not been well established. 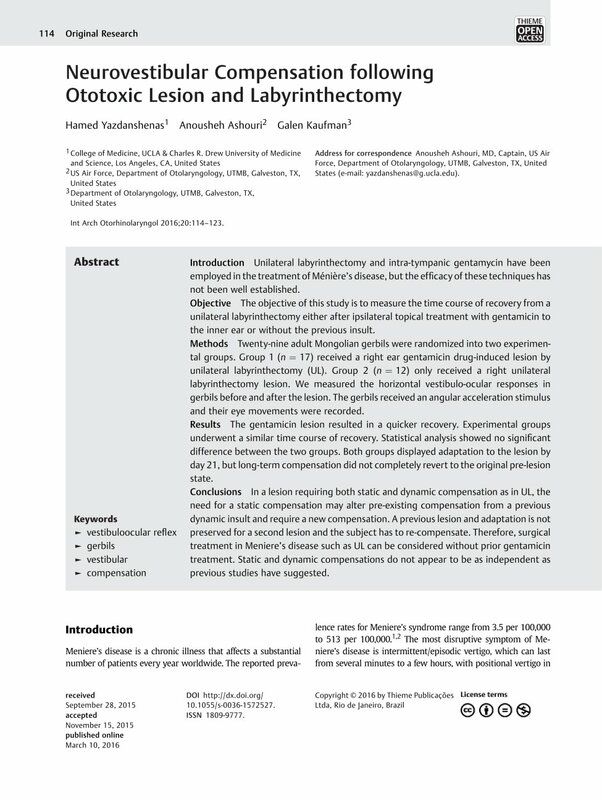 Objective The objective of this study is to measure the time course of recovery from a unilateral labyrinthectomy either after ipsilateral topical treatment with gentamicin to the inner ear or without the previous insult. Methods Twenty-nine adult Mongolian gerbils were randomized into two experimental groups. Group 1 (n = 17) received a right ear gentamicin drug-induced lesion by unilateral labyrinthectomy (UL). Group 2 (n = 12) only received a right unilateral labyrinthectomy lesion. We measured the horizontal vestibulo-ocular responses in gerbils before and after the lesion. The gerbils received an angular acceleration stimulus and their eye movements were recorded. Results The gentamicin lesion resulted in a quicker recovery. Experimental groups underwent a similar time course of recovery. Statistical analysis showed no significant difference between the two groups. Both groups displayed adaptation to the lesion by day 21, but long-term compensation did not completely revert to the original pre-lesion state. Conclusions In a lesion requiring both static and dynamic compensation as in UL, the need for a static compensation may alter pre-existing compensation from a previous dynamic insult and require a new compensation. A previous lesion and adaptation is not preserved for a second lesion and the subject has to re-compensate. Therefore, surgical treatment in Meniere's disease such as UL can be considered without prior gentamicin treatment. Static and dynamic compensations do not appear to be as independent as previous studies have suggested.